In order from left to right: Denton Hewgill Sensei, 7th Dan, President of the Canadian Iaido Association; Kato Haruo Sensei, 10th Dan Hanshi, ZNIR Vice President and President of the Kantō region federation; Tanida Hiroshi Sensei, 10th Dan Hanshi, Head of ZNIR Secretary Bureau of the Kantō region. Iaido is the traditional Japanese martial art of drawing and cutting with the samurai sword. The purpose of Iaido is to develop awareness, centeredness, sincerity, a calm mind, and mental and physical harmony through the practice of traditional sword techniques. Iaido practitioners, or Iaidoka, perform predetermined techniques, or waza, to replicate a specific situation and the correct way to respond to these situations with defending or attacking techniques. It was derived from Iaijutsu, a specialization of Kenjutsu. It is the Japanese martial art that is most closely associated with the samurai class and Japanese nobility. It is not considered a sport, but rather a unique and ancient traditional art for the development of mind, body, and spirit. Iai translates literally to “meeting in a place” but a deeper meaning is “flowing from peace, to conflict, then back to peace”. This transmission from peace to conflict and back again with an innate state, neither prepared nor unprepared of mind is the most difficult part to train, for a samurai or martial artist. The Canadian Iaido Association (ZNIR/CIA) was established in 1993 to promote iaido in Canada, establish formal links with the All Japan Iaido Federation (ZNIR), to hold seminars on a regular basis with high-ranking teachers of the ZNIR, and to administer dan examinations in Canada in accordance with the standards and methods of the ZNIR. The Association is a non-profit organization registered with the British Columbia Provincial Government. Instructors are volunteers and receive no pay. The 26th annual ZNIR/CIA Summer Iaido Seminar will be held in Victoria, BC, from May 24 to May 26, 2019, at the Lochside School in beautiful Victoria British Columbia. Happy New Year 2019! 明けましておめでとうございます! 2018 brought us some new faces and returning practitioners. We again had an excellent summer seminar and a very productive gasshuku. We look forward to all that 2019 brings! Chris Tooley Sensei (Renshi, ZNIR) will be opening a new Dojo on Tuesday nights from 6:30PM to 8:00PM at the Burnside Gorge Community Centre, starting January 8, 2019. 2nd Shoshinkai Gasshuku 第二回初心会合宿 Complete! Our second Shoshinkai November 2018 Gasshuku is complete! Thanks to all who attended, and please remember what we went over and write down/practice the techniques. Everyone worked hard until late in the night. We look forward to future Gasshukus! 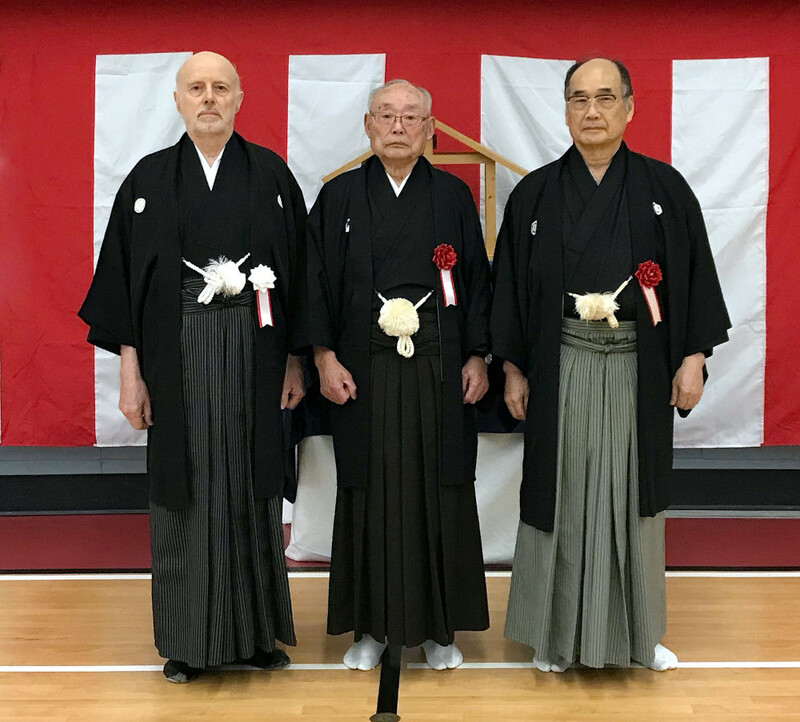 The Victoria Nikkei Cultural Society (VNCS) held their annual cultural fair Saturday, October 27, 2018, and Shoshinkai Victoria once again had the pleasure to demonstrate Iaido.